If you’ve been looking for a way to releasing your inner James Bond character, then consider buying spy cameras and mind you, the smallest of the spy cameras are very good in spying on people or your valuable properties without being seen. Disguised as ordinary things such as clocks/watches, outlets, pens, or incorporated into other much newer technologies, spy cameras have been making progress over the past couple of years. Today, there’s such a wide variety of spy camera products to choose from for your every specific purpose and for any situation. Some people use these spy cameras to spy on family members, co-workers, and others use them to protect against home invaders. These might be the most common uses of a spy camera, but they’re also frequently used for outdoor fun and also great for filming pranks using internet connectivity or remotely connected routers. We have purchased, tested and reviewed our favorite and tiniest Spy Cameras you can buy online, below our top selection sorted by the best bang for your buck! 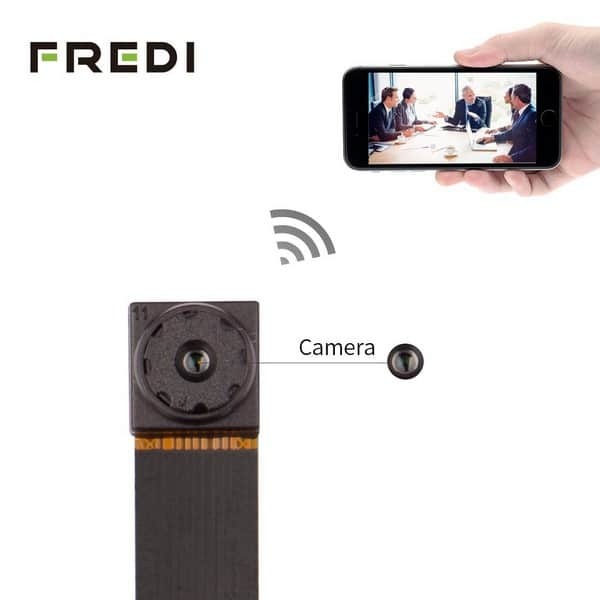 This FREDI Super Small wifi camera is the world’s smallest HD camera, perfect for camera and video recording. It can portably record every happening at every moment. This spy camera is very easy to setup using a unique QR code setup. This super small mini hidden spy camera can monitor and secure the interiors of residential abode such as apartments, bedrooms, family rooms, garages, guest houses, nurseries and much more. Additionally, it is suitable for your businesses in monitoring and securing the interiors such as offices, lobbies, showrooms, stock rooms, service desks, warehouses, and much more. » Size: This super small V55 camera can support 32GB SD card maximum, it is easily hidden and can record both photos and video without anyone paying attention. » WiFi Connectivity: Connects to your phone and view or record live videos anywhere at any time you want. » Motion detection: Set this function in APP, then you’re good to go. When a motion is sensed, it will take a photo and pushed a message on your phone. » Loop Recording: Once the memory reaches full capacity, it will automatically cover the oldest video on files. Can also record and charge simultaneously that you will never worry about running out of battery power. » Battery Life: High and long capacity battery included and support 7 hours of video recording. 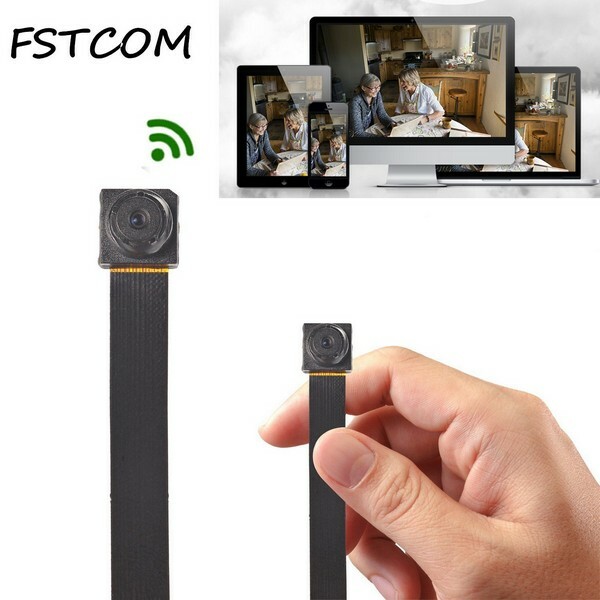 The FSTCOM Super Mini Portable Hidden & Spy Security Detection Camera is the world’s smallest portable Bluetooth Wi-Fi camera, but big enough to be able to record and capture every moment at any time. 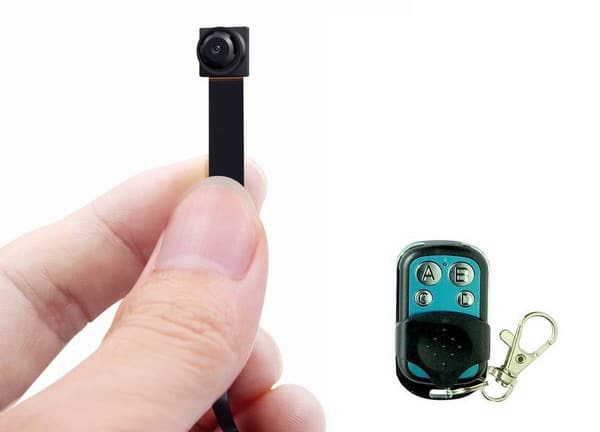 This spy camera can also be used for baby monitoring, car recording, hidden video recording, video surveillance, PC camera and meeting recording. This lightweight, mini size, and thin spy camera are easier to be carried or hidden in the corner. This spy camera comes with a Micro SD Card (Max 32GB) local storage and better image quality, thanks to its 1920 x 1080P max definition ratio and 720P video quality, your videos will come out with flawless resolution and exactness. Additionally, for utmost privacy and security, BVCAM apps that greatly simplifies the use of IPCamera and Pivot devices are linked to the servers by way of a bank-level AES 256-bit encryption and TLS (Transport Layer Security) and all videos and pictures captured are secured with AES 256-bit symmetric-key encryption. » Size: It’s too small you can even use the buttons to sew it on the clothes and record both photos and video without attracting attention. » WIFI motion activated: Distance limitations is not a hindrance to viewing or recording live videos. This can be connected to a PC computer, a smartphone or a tablet app to view and control this spy outlet. » Free backup device: Support recording and charging at the same time and support 24/7 hours video recording. High capacity rechargeable battery included. The smallest in designed, lightweight and compact MAGENDARA Mini Spy Camera that can be placed on desks, desk lamps, bookshelves, or anywhere else that does not appear visible to protect your family, home, and business. This spy camera can monitor in real-time as a Nanny cam, a pet cam to keeping an eye on your little baby and pets, home security, and secret business monitoring. It’s a mini button hidden camera is the world’s smallest camera fit for all kinds of portable tools. It brings high-definition video and picture quality with its 1920x1080P video resolution plus it provides 10 hours of sustainable recording delivered by a built-in 3800 mA lithium rechargeable battery. The PANNOVO 120 spy camera is also one of the world’s smallest camera with a 120-degree wide angle that can be fitted into all kinds of portable tools and devices. This camera comes with an Ultra HD 6 Black LED lights night vision (LED light do not bright and flash when recording) and an easy to connect and use Wi-Fi camera, a WiFi distance of about 80-100m, and remotely connect distance of 15m (the distance from the router to camera). It brings high-definition video and picture quality with its 1280x720P video resolution. This spy camera support recording and charging at the same time and also support loop video recording at 5 minutes per section, coupled with a built-in rechargeable 300 mA lithium battery that can sustain recording of up to 70 minutes. This mini HD 720P Wireless WIFI spy camera will faithfully and firmly record your uninvited guest’s action in real-time. » Motion detection: When motion is detected, this spy camera will start recording automatically. » APP Software: Camera has own APP Software in manual, you should download and install on your cell phone. This AOBO Spy Camera 640P Wireless WiFi Hidden Camera can connect 4 cameras simultaneously and also view a live video image in between the 4 cameras. This spy camera has lens less than 0.31 inch suitable for outdoor and indoor portable tools. It supports motion detection, that when a motion is detected, it takes a picture and push a message on your phone. It also supports recording and charging at the same time coupled with a rechargeable high capacity 4000mAh polymer lithium battery. It’s Wi-Fi IP camera supports Android APP Remote View or Control and Windows IOS and that includes short range and remote modes. By directly connecting to your smartphone or PC, you can watch both photos and videos from the camera in real-time. Spy cameras come in a variety and unique in every aspect of designs far beyond than just a simple camera. Choose a camera that looks natural and blends in well with its surroundings. There are two major recording choices you can choose, self-recording and wireless streaming. Self-recording uses internal memory or an SD card where you can save all your videos and photos, and wireless streaming options allow you to view your videos and photos in real-time via a secure website or smartphone app. Weight and size are two important factors in making up your decision in choosing the perfect spy camera. Surely, you want a spy camera small enough to be stealthily hidden on your person and portable and lightweight enough to be worn conveniently and comfortably or ruggedly enough for home security. Battery life and battery type also play an important role in choosing your spy camera. Although it will vary from model to model, the best option will totally depend on your needs and personal preferences. Fairly notable influences are night vision capabilities and motion detection. Night vision is a feature that allows viewing of videos and photos taken in low-light, great for home security. Motion detection is also great for home and business security especially those that can push a message on your phone when motion is detected. It’s always been a good idea to have a set of electronic spy cameras in your home when a nanny is taking care of your children or seeing to it that your personal belongings at home are properly taken care of when you were away. But before making any purchases, it is very important to look first the best spy camera for your specific needs and since these cameras are using several different technologies, you must also consider the specifications of each product. With such many kinds of cameras flooding the market today, in this 5 + Best Smallest Spy Cameras Money Can Buy list and reviews, we will go over not only the kind of spy camera to look for but what spy cameras might have been watching you now! Spy cameras come in all shapes and sizes these days, but of course, a spy camera quality will differ from camera to camera. So, it is only incumbent upon yourself to must choose the spy camera based on your preferences and requirements. Spy cameras, as the name suggests and very much unlike some wearable technology, such as smart glasses, tend to be a lot more discreet than other cameras and can secretly record or take pictures without the knowledge of anyone in range of the camera. A spy camera will either be small or it will be etched into an object such as a toy, to avoid suspicion, unlike smartwatches and smart glasses which are visible.